Cook and warm foods with consistent results by using this 36-inch GE built-in electric cooktop. Its smooth glass surface keeps pans flat and stable, and five heating elements, including a power boil and a warming element, let you customize your cooking techniques. This GE built-in electric cooktop has indicator lights for safety. This GE cooktop offers a ceramic glass surface that makes cleaning quick and easy, and is built right into your kitchen countertop. The model features other details that make cooking more convenient than ever, including two brightly glowing ribbon heating elements positioned beneath the smooth cooktop surface. Even heat is directed straight up to the pan for high speed heat-up. You'll also get a heating element with PowerBoil capabilities that can accommodate various sizes of pots or pans while also working to speed up the boiling process. Chef 36 inch Glass-Ceramic Induction Cooktop Adjustable functions allowing to simmer or boil within instants, the Ancona Chef 36 inch induction cooktop will change your cooking experience forever. Displaying a stylish and minimalistic design, this induction cooktop features a wide range of heating levels for all type of cooking, as well as a Boost feature for rapid boiling. The electromagnetic field quickly reaches high temperatures, with integrated cookware sensors that prevent empty burners from heating up by accident. Built from high quality Schott Ceran., this German fabricated surface is easy to clean and maintain, while minimizing accidents and messy spills. The timer (auto-delay shut-off) function allows you to control your cooking time, and the lock function prevents any setting changes. The sleek design, powerful performance, and easy-to-use features, will revitalize your kitchen layout and cooking dynamic. Chef 36 inch Glass-Ceramic Induction Cooktop is rated 3.4 out of 5 by 5. Rated 2 out of 5 by kwsINwa from Don’t buy this product I purchased this cooktop and had it installed one year ago. Within 6 months, the large burner started erroring with every use, regardless of cookware. Once I reached Ancona customer service, the representative was very helpful. I’m currently awaiting a replacement cooktop. Save yourself some stress and purchase a different cooktop. Rated 1 out of 5 by BurnedbyAncona from We received the stove, hooked it up to 240 Volt circuit, turned it on and..... NOTHING. Nothing l... We received the stove, hooked it up to 240 Volt circuit, turned it on and..... NOTHING. Nothing lit up, beeped, chimed - nothing. Strike one. I called customer service - answering machine. I called again the next day and the next (about 10 time over three days during business hours) - no answer EVER. Strike 2.. I found the email and did get a reply - but the lady couldn't help me because the ONLY tech support person was on vacation for 3 weeks. I asked if there was anyone else who could help me and she said no. Strike 3, Ancona. Maybe you'll get lucky and it will work. Good luck. Rated 5 out of 5 by Jackie from I was replacing an existing 36" stovetop. The Ancona stovetop... I was replacing an existing 36" stovetop. The Ancona stovetop fit right in without any problem. I have been cooking with the different burners and using different settings. I am so pleased with the unit. 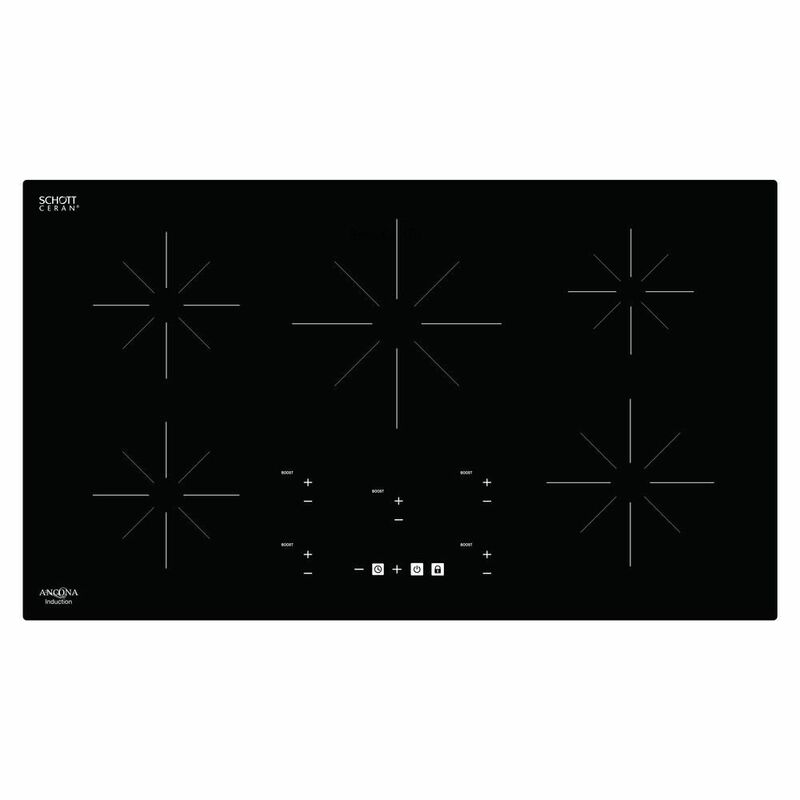 Rated 4 out of 5 by PS from I would give this cooktop 5 stars based on the price alone if it weren’t for the controls. It au... I would give this cooktop 5 stars based on the price alone if it weren’t for the controls. It automatically locks all the controls – even if you are cooking – after five minutes if no buttons have been pressed. To turn on a burner you must 1) press unlock 2) press the power button for the whole cooktop 3) press the plus button on the burner you want to use 4) press either the plus button again to start at 9 or the minus button to start at 1 5) keep pressing until you get the power level you want To turn a single burner off without turning off the entire cooktop you have to press the minus button repeatedly until you get to zero. And you may have to press the unlock button first if it’s been over five minutes since you pressed anything. It’s a brain game to run this thing – especially while cooking. This is far too complicated and not at all intuitive. If I had realized all of this before I purchased the cooktop, or even installed it, I would have bought a different one even thought the next one up was at least $500 more. This is all in the instructions but until you use the cooktop you don’t realize how crazy making it is. My particular unit will randomly buzz for several seconds when not in use – it isn’t loud, often or even annoying, just slightly concerning. I am waiting to hear from Ancona about whether this is normal or not. On the positives – at $1100 for a 36 inch induction cooktop this a deal that no other manufacturer is close to in price point. It’s also powerful. I’m having to adjust because it cooks hotter and faster than my previous induction cooktop. And although I have a wall oven, if I wanted to install an oven underneath this cooktop I could, which you can’t do with a lot of them because of the clearance needed. It’s not very deep and only weighs about 16 pounds. Installation was simple which is a good thing because there isn’t much in the way of instructions. I have had a GE Monogram induction cooktop for about 10 years and don’t ever want go back to straight electric or gas. I’d rather cook on portable induction hobs than go back. I loved the GE but it blew a burner, which was going to cost well over $1000 to repair. And with the possibility of the other four burners doing the same I just thought it best to start fresh. I do recommend this entry-level induction cooktop, I've had it about a week, as long as you don’t mind the brainteaser controls.